Videos can serve as an introduction, they can teach viewers about your product, or they can help establish your company as an expert by helping consumers solve a problem. Whatever your social media video goals are, it’s important to properly execute the creation and distribution of your content. 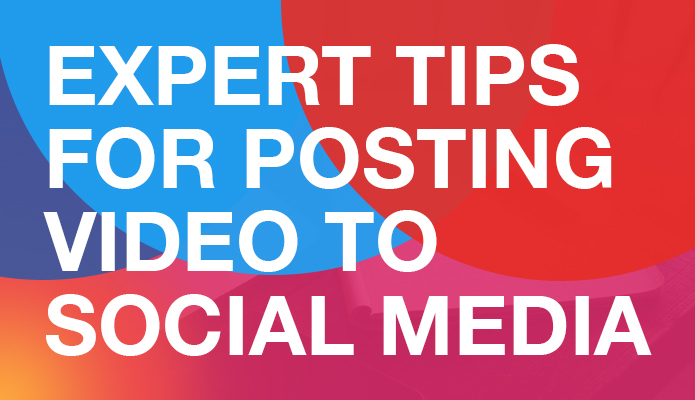 Posting videos to social media can help you reach your social media goals. The first question you should ask yourself when embarking on your social video journey is, what type of video should I create? Or better still, what type of video content does my social audience want? The attention span of viewers on social media is short, so you have to be posting videos to social media that provide value quickly. A good rule of thumb for posting video is to create content that is either unique or that teaches a viewer something useful. If you choose to go with the first option, something unique, consider what you can provide to viewers that others cannot. For example, a behind the scenes look at your facility is something competitor’s will not have. This type of video also gives your company the opportunity to show some personality and help viewers connect with your products and services. Creating a how-to video can also be impactful. How many times have you scrolled through your Facebook feed and stopped to watch a video demonstrating something? For me, it’s cooking videos. Tasty is a group that shares videos almost every day that are less than a minute long. Now that you’ve figured out what type of video content will work best for your company, it’s time to create and post. Here are eleven rules to follow when you start posting video to social. You only have a few seconds to capture the attention of someone scrolling through social media. Make your videos concise. Some platforms will limit the length of video you can post. For example, Instagram limits a video post to 60 seconds. While some platforms allow for longer videos, keep it short and sweet. Most videos posted to social media should range from 15 to 45 seconds. There is even more incentive nowadays to keep your Facebook videos short. Facebook is testing ads that play mid-roll, meaning in the middle of your Facebook video. This could become the new norm for videos longer than 90 seconds. On Facebook, we have also found that fun, kind-hearted or emotional stories are the ones that get shared. It’s important to understand your audience and understand what they are interested in. Take only the time you need to communicate the message. Having an image or video that attracts viewers is only half of the battle. You must also have a headline that is clear and to the point. Some viewers rely on the headline when deciding whether to watch a social video. Videos posted to social media are short, sometimes just fifteen seconds long. Clearly, you don’t have time to waste. Make sure your videos focus on one topic or demonstration. Viewers will get exactly what they are looking for quickly and you are able to save additional ideas for new videos. It is ideal to do so in the first 10 seconds. In the beginning of the video, avoid an introduction and heavy branding that makes it look like a commercial. The majority of people do not listen to audio on social media. Digiday reports that 85% of Facebook video is watched without sound. Subtitles can help capture the attention of those who are quickly scrolling. It can also help those who are unable to listen to audio, for example, someone in a crowded elevator, still engage with your content. We recommend adding the subtitle text into the video so that you have better control over how the text looks when it’s displayed, and to avoid working with file requirements for uploading separate subtitle data. Optimization is critical for businesses posting online. Using the right keywords or phrases in your headline and videos can help more people find your content organically. Posting video in the 4:5 format will you help maximize newsfeed real estate and provide a better experience for the three-quarters of Facebook users that are on mobile devices. Your social goals should be oriented around Likes, Shares, and Followers. Views and click-throughs are not good measurements unless it is a paid promotion soliciting a direct response. If you audience liked it, there is a good chance than an extended audience will also like it. Promoting a post that performs well organically is a strategic way to grow followers. Just like other social media posts, only a small percentage of your followers will see your video post. Re-posting content will increase the number of social media users that see your content. Everything we’ve gone over is specifically designed to help you maximize your video reach through social media. Just in case you feel like this is information overload, make sure to implement these strategies one at a time. Introducing video to a social media strategy may seem daunting at first but when your social accounts reap the rewards, it will be worthwhile.